This business flow outlines how a company analyzes or anticipates demand, and translates that demand into a production plan. 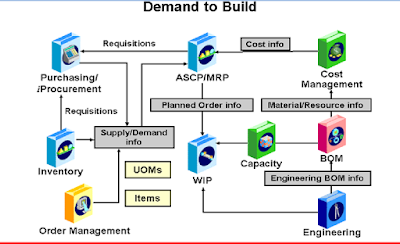 ⦁ Advanced Supply Chain Planning (ASCP)/Material Requirements Planning (MRP): Creates constraint-based or optimized plans and requisitions (purchase or internal) to replenish Inventory. 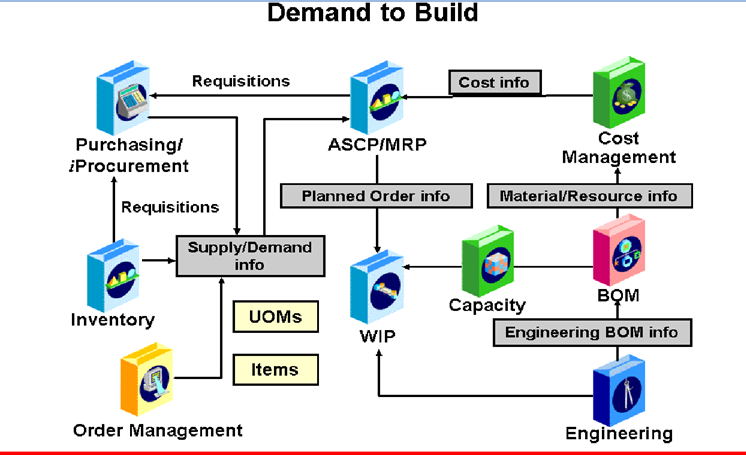 ⦁ Cost Management: Supplies cost information for optimized planning. ⦁ Oracle Work in Progress (WIP): Uses discrete, project, repetitive, assemble-to-order, work-order-less, or a combination of manufacturing methods. Inquiries and reports provide a complete picture of transactions, materials, resources, costs, and job and schedule progress. ⦁ Capacity: Calculates your capacity load ratio by resource or production line, thereby ensuring that you have sufficient capacity to meet your production requirements. ⦁ Bills of Material (BOM): Stores lists of items associated with a parent item and information about how each item is related to its parent. ⦁ Purchasing/iProcurement: Requisitions are received from Inventory and ASCP/MRP. Procures goods and services, and records periodic and perpetual accruals. ⦁ Inventory: Sets up inventory/expense items and records inventory activity such as receipts of inventory, returns, and corrections. ⦁ Order Management: Demand is based on sales orders.